When Family Research Council opened its doors in 1983, official Washington paid it little attention. After all, cause-oriented nonprofits are a dime a dozen in the nation's capital, new policy shops come and go, and most wither away over time. Not Family Research Council. FRC would prove to have lasting influence on the affairs of the nation. 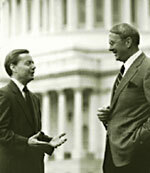 In time, FRC became one of America's most creative and effective policy organizations. The seeds for FRC's growth were planted in a time of turmoil and watered with work and prayer. After attending a research planning meeting for President Carter's 1980 White House Conference on Families, Dr. James Dobson met and prayed with a group of eight Christian leaders at a Washington hotel. From that beginning resolve was formed to establish Family Research Council, and one of those present that night, Gerald P. Regier, became our first president. FRC's immediate goal was to counter the credentialed voices arrayed against life and family with equally capable men and women of faith. Drawing upon his experience at the Department of Health and Human Services in the Reagan administration, Regier developed fresh means to link pro-family experts with government research and policy making offices. He arranged for Congressional testimony, provided reports to elected officials, amassed evidence for legal briefs on family issues, helped secure appointments on government panels, and offered media commentary. This foundational work formed the core for FRC's long-term success. In 1988 FRC merged with and became a division of Focus on the Family. Gary L. Bauer, former Under Secretary of Education and domestic policy adviser to President Reagan, assumed leadership of FRC. With an infusion of funding from a generous family, he immediately helped raise its public profile and impact. With new battles over a national child care system and the arrival of the Clinton administration, FRC was thrust into the midst of several social issue debates that gripped the nation. In response, Bauer gave close attention to building a national network of concerned citizens and educated activists eager to engage the national issues. Throughout the 1990s FRC's expert and grassroots networks grew exponentially. FRC moved to establish permanent bases from which to fight for "the permanent things." Thanks to the generosity of the DeVos and Prince families of Western Michigan, a home office was established in the heart of a revitalized Washington, D.C., and a dynamic distribution center was opened in Holland, Michigan. This strategic presence distinguishes FRC and its intention to make a lasting difference for timeless values across our land. Today our Washington home at Gallery Place stands at the hub of a thriving city, a sign of our determination to preserve and advance the heritage of religious belief and family values handed down from generation to generation. In 1992, FRC made another strategic decision that afforded it greater scope, once again becoming an independent nonprofit. An independent board was created, sharing three members, including Dr. Dobson, with the board of directors of Focus on the Family. In 2000, FRC's board of directors appointed Kenneth L. Connor -- a prominent Florida attorney and national pro-life leader -- as our third president. During his time at the helm, Connor sought to sharpen FRC's public policy agenda, with special focus on the sanctity of human life, defense of man-woman marriage, humane elder care, religious liberty, parental choice in education, and family tax relief. Connor also sought to ensure that FRC would be better known for what it advocated than what it opposed. He attracted prominent scholars to partner with FRC, spoke passionately for the most vulnerable members of society, and promoted the highly respected Witherspoon Fellowship. Under his leadership the Fellowship rose to new influence as a Biblically-based, semester-long academic and practical training ground for future cultural and civic leaders. FRC welcomed Tony R. Perkins in 2003 as our fourth president. He had served for eight years in the Louisiana legislature, where he pioneered measures like the nation's first covenant marriage law. Tony began his tenure at FRC just as the nationwide struggle to preserve man-woman marriage exploded. With the unprecedented decision of Massachusetts' highest court, a new issue was joined and the stakes in the judicial confirmation process at the federal level were raised another notch. To all this Tony brought the profound conviction that campaigns to protect the family and the church could not succeed without a renewal of cultural engagement among the pastorate. Guided by this vision, FRC established Church Ministries, its first new department in nearly a decade, to reach out to pastors and to equip and embolden them. At a time of global political uncertainty where foundational institutions are endangered as never before, where marriage is undermined and human life itself is being redefined, leaders must stand strong in the pulpits as well as the halls of power. As FRC deepens its mission and renews its vision, we look forward with hope and confidence to the future. Today our policy department is assembling a new team of credentialed experts equipped with cutting-edge analysis and research. Our government affairs division, recognized by friend and foe alike for its excellence and character, is a force on Capitol Hill and in the Executive Branch. Our communications team and the spokesmen it puts forward daily have become the "family voice" of choice for the national and even international media. FRC is going wherever technology will carry words and images. Through broadcast video, the Internet, and radio, via RSS feeds and IPod downloads, by guest editorials and print interviews, through legal briefs and on-campus debates, using sermon notes and even tracking votes, FRC is making the cause of faith, family and freedom real and immediate. Not content to champion our cause for this day only, we continue to work with the rising generation through student internships to make a permanent home for family advocacy here at the seat of national government. 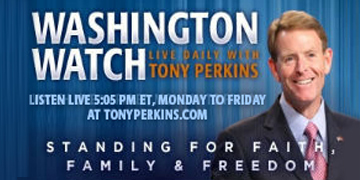 Thanks to the vision and dedication of its founders and leaders, past and present, along with the faithful prayers and generosity of its friends, today's Family Research Council continues to bring evidence and argument to the public square. We have had the privilege for 30 years to champion all that the Author of Life has given us. We ask His blessing anew as we strive to preserve His gifts of faith, family and freedom for years to come.